My Android phone has stopped detecting my micro SD card and when I connect it to my computer via card reader, even the computer is not able to detect it. Please help me, I have lost of precious photos in my micro SD card. Before I provide any solutions to repair your undetected micro SD card, I would like to recommend you to use Photo Recovery software to recover your precious photos from undetected micro SD card. Connect your not detected microSD card to Windows computer with the help of card reader. On your computer, click “Start” and type CMD in search address bar and hit ENTER. This will open a new command prompt window. 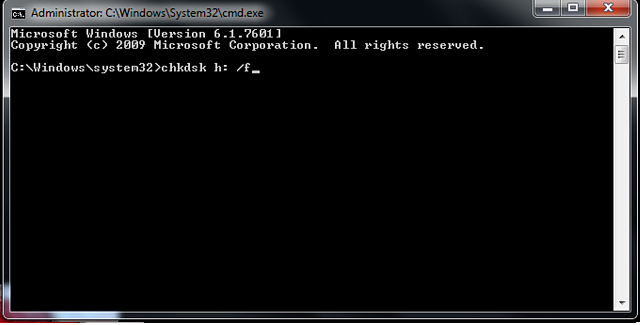 In the command prompt windows, type the following command: “chkdsk /X /f H:” or “chkdsk H: /f” and press ENTER. [Note: Here you need to replace H: drive with your microSD card letter name. After this Windows will search for the corruptions or errors and if it finds any errors/corruption, then it will fix them. Once, the process gets completed successfully, you can now re-use your micro SD card without any issue. In some cases, your card may not get detected, if there is any issue or damages in card reader, USB cable or computer USB port. So, in such case, you must first check your USB port, card reader and USB cable if they are good and working properly. You can also connect your card to another USB port or computer, just to check.